For many, Rebecca Charlton is someone that needs no introduction! But I'll introduce her anyway - TV presenter, journalist, commentator, voiceover artist, ride captain for Hot Chillee, author, ooh and bike rider! When I first met Becca, about 10 years ago she wasn't doing all of these things. 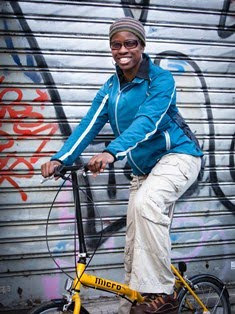 She was certainly bike riding and getting into journalism. Over the years she has worked hard to move up the rankings, and now works alongside all the movers and shakers in the cycling world. Despite all this, Becca remains very down-to-earth and for me she is still the girl that I used to train with at the sessions at Herne Hill Velodrome on a Wednesday evening or a Saturday morning, back in the days when the velodrome was constantly under threat of closure, the facilities were very spartan, and it was a big deal to get more than four women turning up at the track league. Rebecca has been a stalwart of cycling for many years and I am very pleased and thank her for telling her story for this series. 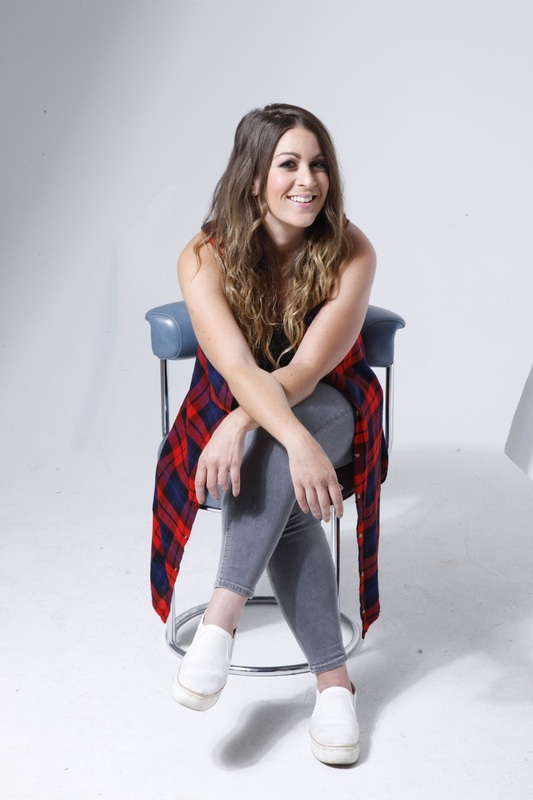 If you want to see Rebecca presenting you can catch her at the 24-hour cycle relay race and festival of cycling, Revolve 24 at Brands Hatch motor circuit on 16th/17th September. My family introduced me to cycling when they took my stabilisers off and I have never looked back. We were massively into cycling. The whole family would go to cyclo-cross races every weekend in the winter and track in the summer. It was a huge part of our lives growing up. My dad had raced on the road and track since he was a school-boy, my brother raced in the age category above me on the track and off-road and my mum would often race too. I remember the festival vibe of a mountain bike race - we’d travel up the day before, race on the Sunday and watch the elite categories after the youth and junior races. The trials legend that is Martyn Ashton would always be there doing tricks. I was in absolute awe watching him, and so to work with him recently was a special moment. As a child, I raced on the velodrome as an under-10 but dabbled in mountain biking, cyclo-cross and BMX too. Every Saturday morning we’d be at Preston Park track for training, and there again for racing on Wednesday as my dad ran the Brighton track league. I found I had quite a natural sprint and was happy to be able to beat all the boys! I raced a bit of everything but in my age category it was always against the boys. I represented my school in the national hard track championships at Herne Hill (see attached photo - number 78) and remember being really excited that there were four other girls in my category, four! Some of the names from that day have gone onto become quite handy on a bike...(number 16, a certain Bradley Wiggins!). Nowadays, I report on the Revolution Future Stars championships and the girls' racing is so highly competitive and fielded by the best youths in the country. It’s so brilliant to see how much things have changed. When I raced my first national track championships at the age of 12 in Manchester Velodrome, Hugh Porter was very surprised to be commentating on a girl in the pursuit. That’s how different things were back then. Once I got my teens things changed a little as in my mind I began to think it wasn't cool to be seen on a bike at that time, and I was tempted to stop riding. I was a very feminine teenager - into my hair, make-up and fashion but I'd scrub it all off before a bike race. It was like leading a double life - one with my school friends, and the other in the cycling world. I never would have asked my friends to come and watch me! I’m so proud to be a cyclist now, and can’t imagine feeling like this today. To an extent I think I was lacking the kind of female role models we have today. Don’t get me wrong, I looked up to some incredible women who were racing at that time, but I wasn’t surrounded by many cycle racing girls like me in my immediate environment. I got into journalism because it was something I'd always wanted to do. From the age of about 5 I wanted to be a press packer, and being a magazine editor or a TV presenter really appealed to me. I love talking to people, learning what makes someone tick, and what drives them. I’m often told I’m a good listener and I think that’s the most important aspect of the job and the most enjoyable. I obtained a degree in journalism from Bournemouth University, specialising in broadcasting which has always been my passion. From there I worked on the features desk in the Heat magazine office, and did a stint in a local radio station, Juice 107.2 in Brighton. 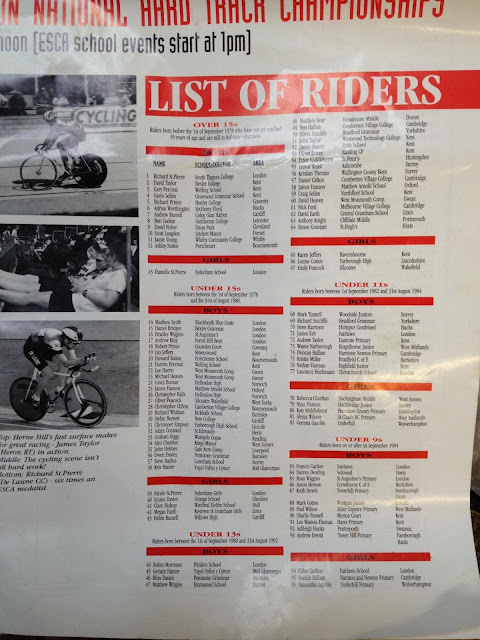 I was racing at Newport Velodrome at that time, when a friend mentioned he knew a publisher who was launching a new cycling magazine and it all went from there. Fast forward ten years or so and I have presented on Eurosport, Sky, Channel 4, ITV and BT Sport alongside carrying out my deputy editor role at Time Inc magazines (which I left a year ago to go freelance). Since then, I have been represented by my brilliant agent Emma Wade, and it’s been an exciting 12 months. I am lucky to work alongside so many talented TV personalities, riders and producers that I could write you a long list here. 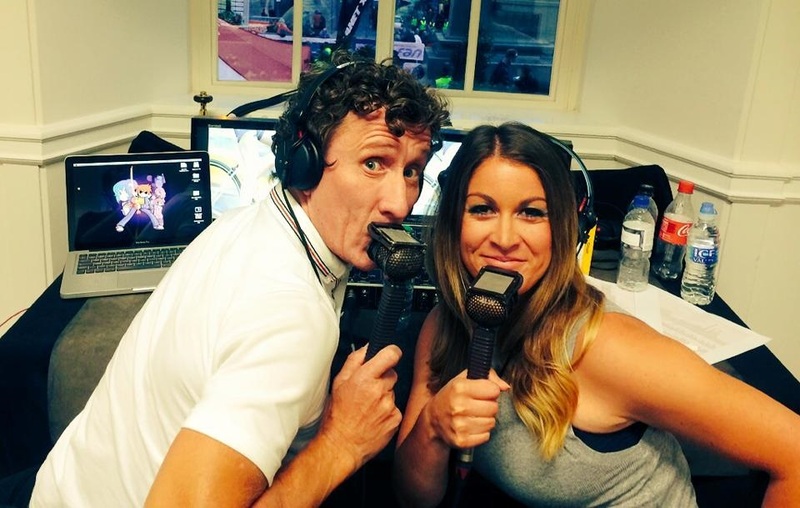 I think it's so important to have a good rapport with your co-host, co-commentator or presenting team, and the cycling world is a particularly enjoyable environment to work in. In the last couple of years I have started commentating too and have learned so much from working with the brilliant Anthony McCrossan. He was the man who teamed me up with Matt Stephens and Sharon Laws* who are not only incredibly talented riders and broadcasters, but never fail to make me giggle. 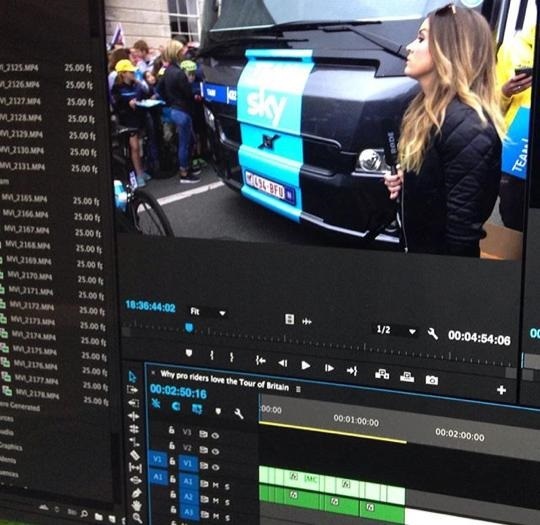 Covering the Tour de France is the biggest buzz for any cycling reporter. My first full Tour was unbelievably ten years ago back in 2007, kicking off of course in London. It's hard work, full on, exciting, stressful at times, but the ultimate dream job for anyone with this level of passion for cycling. You learn a lot behind the scenes - I was harnessed on to a publicity caravan float, watched the leaders’ jerseys printed each day behind the podium, and got to know many of the international journalists in the press room. The most interesting person I've interviewed has to be Katie Archibald. She's always so insightful, sharp and entertaining, I always look forward to our chats as they’re usually unpredictable! When it comes to interviewing pro racers I'd say my ability as an interviewer not only comes from my journalistic background but also from the fact that I know exactly what it's like when you haven't performed. as you wanted in a race, or when you are gearing up to race. The last thing you want to do is talk to anyone about it! If a rider is warming up or rushing to change a gear in between track races at the velodrome I appreciate the pressure they're under and so am unlikely to stick a microphone in their face at that moment. It's about mutual respect. It's part and parcel of the ups and downs of being a pro cyclist, and I have a huge amount of empathy and appreciate what's going through a rider's mind. Live television is the most fun aspect of my job because you can't always predict what's going to happen. People accidentally swear on camera, or don’t say what you’d expect, but rolling with it is all part of that adrenaline! Once when I was interviewing someone I couldn't get on my chair as it was a high stool that kept swivelling round. I ended up hanging half off it for the whole interview! I think women are in an incredibly healthy place within the cycling media and I am regularly working alongside such respected females when it comes to cycling coverage. Within print journalism you have Hayley Ferguson, now editor of Bike Biz, Danielle Welton at the helm of Casquette magazine and Hannah Bussey, a brilliant tech and features writer and a very handy rider. There are of course many, many more women in the industry I haven't mentioned too. It’s a far cry from the days where I was working in a predominantly male populated environment. 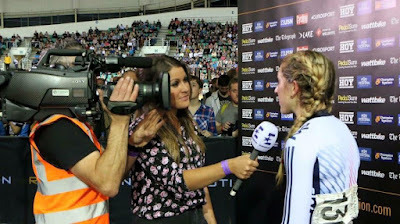 When I was on the presenting line-up for the Revolution series with Sian Welby and Lizzie Deignan that was the first time I'd been a part of an all-female team on Channel 4's sport coverage, that was a great moment. My advice to anyone wanting to get into cycling journalism is to be ready to work hard, unpredictable hours. You need to be able to take constructive criticism and feedback, and to be adaptable and know your subject. But above all keep knocking on doors and keep telling people how passionate you are, and it will pay off! Stage races include early, sleep mornings and waiting around! These days cycle ‘training' has really gone on the back-burner now that I’m focused on my job as a presenter, which includes a lot of travel without my bike. With racing so highly competitive now, it’s hard to dip in and out, quite rightly! But I still spend a lot of time on the bike, sometimes with pro riders, for which I need an amount of fitness for! I tend to go for time-poor training now, including HIIT (High Intensity Interval Training) on a Wattbike or stick my running kit in my bag and get out for some hill reps on foot. 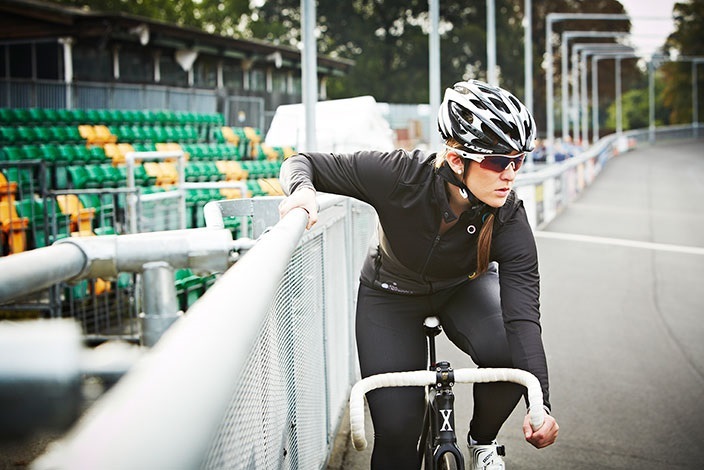 When I’m at home I always try to get down to Herne Hill Velodrome, and I get out on the road whenever I can too. When cycling I never go out without my ID. My dad was hit by a car and left in an induced coma two years ago. It's really made me place importance on carrying something with an emergency contact number, ID and allergies on it as so many of us lock our phones these days. It's not a nice thought but well worth sticking in your jersey pocket or on a wrist band. I like to do a other sporting activities too. I’ve got really into the Park Run even though I’m pretty slow. I really don’t think it matters and I’m not ashamed to say it at all. I think everyone should enjoy getting as active as they can even if you’re coming in last. Park Run is a great work-out and it’s free, thanks to the incredible volunteers across the country. All you need to do is download your barcode and turn up to your nearest registered park. I’m also into mountaineering and hiking and I’ve racked up a few triathlons too! I'd say the key to looking and feeling great when cycling is confidence. 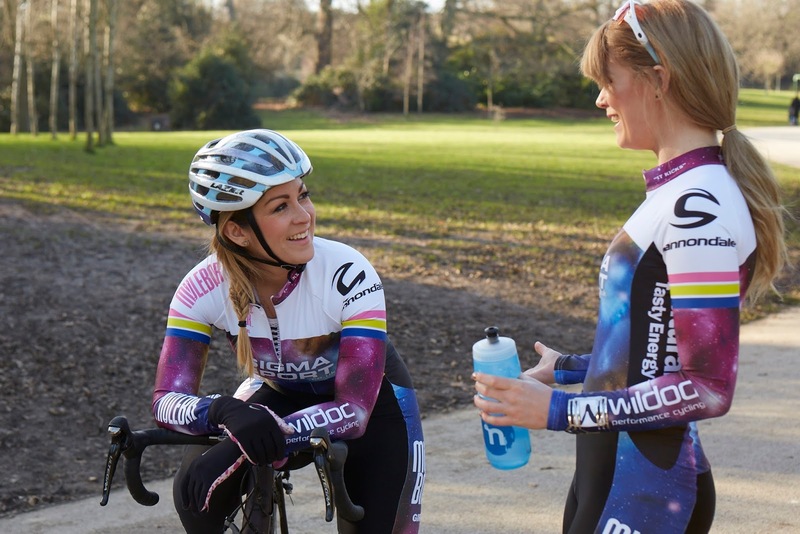 It doesn't matter whether or not you're wearing the latest and greatest kit or if you're built like a mountain goat but if you're comfortable and happy in your own skin you'll ride better, and feel good in the process. Find clothing that fits you well, makes you hold your head high and motivates you to get out and ride. Surround yourself with people that support you and make you smile, whatever your ability on the bike. Confidence shines through. *Update: Tragically, Sharon Laws died aged 43 on December 2017 after being diagnosed with cervical cancer in October 2016. She is greatly missed.